Was it nature or nurture? Plenty of both figured in the life of Milton Joseph Bolling III, a former Red Sox shortstop who spent 43 years with the organization. He was born on August 9, 1930, in Mississippi City, Mississippi, while his parents were on vacation; but he grew up in a baseball town – Mobile, Alabama – which stands as the city of size with more Hall of Famers per capita than any other; the Bolling brothers – Milt and his younger brother Frank – were important influences for more than one generation of boys growing up playing the game. Milt Bolling’s long baseball career started the way most do, by playing catch with his dad. Milt’s father, M.J. “Foots” Bolling, was a very good amateur player who worked in the insurance business by day, but at night and on weekends managed several semipro baseball teams in the area. Both Milt’s father and his uncle Jack worked for the Bolling Insurance Agency in the late 1930s. Uncle John Edward “Jack” Bolling played first base for the Philadelphia Phillies in 1939 and for the Brooklyn Dodgers in 1944. Milt never saw his uncle Jack play in the majors, but was able to see him when he was in the Southern Association with the Atlanta Crackers, the New Orleans Pelicans, and the Mobile Bears. In an interview for this profile, Milt said he owes his love and knowledge of the game to his father: “He was the one who instilled so much baseball knowledge to Frank and myself. Dad loved baseball and he was always there for us.” Milt and Frank’s mother was Fannie Taylor Bolling who died in 2008, at the age of 100. In the 1930s and ’40s, when Milt was growing up, there were no organized youth leagues in the area, but he and Frank (who played 12 seasons with the Tigers and Braves), played pickup games in Crawford Park. Before television and air-conditioning, many boys played even in the very hot and humid summer days of coastal Alabama. The games would go on all day, sometimes ended only by nightfall. The first organized baseball team that Milt played on was in the spring of 1945 at McGill Institute, an all-boys parochial high school in Mobile run by the Brothers of the Sacred Heart. He made the varsity team as a freshman, playing right field and shortstop. A new coach came in for his sophomore year. Wanting to deny the bunt to the opposition, he moved Milt and his strong arm to third base. Mobile had a strong American Legion baseball program and Milt appreciated the help of coach Stan Galle (who had played third base for the 1942 Washington Senators): “I was always indebted to Stan for playing me at shortstop. … He schooled me well in the fundamentals of the position.” At 15 and 16, Milt played with several semipro teams in the Mobile area, teams with rosters full of men who had played professionally. He credited the high caliber of competition with giving him the experience he needed to play in the major leagues himself, although in truth, he said, he never really envisioned himself doing so. Milt’s team in his senior year in high school was rife with talent. From that roster, nine players signed pro baseball contracts. Milt and Frank made it to the majors, two made it to Triple-A, one to Double-A, and the other four played in the lower minor leagues. After graduating from high school in 1948 at the age of 17, Bolling was recruited by George Digby, a legendary Red Sox scout and one of the few non-uniformed people inducted into the Red Sox Hall of Fame. Milt was reluctant to sign, as he had been offered scholarships by a number of colleges. His mother wanted him to go to college and his father hoped for a pro baseball contract for his son. Milt was recruited to play both college baseball and basketball. “I was a good student, and I had a number of colleges interested in me,” he said. Strangely enough, his first scholarship offer was in a sport he had never played, track. The track coach at the University of Alabama saw him play in the state high-school basketball tourney and offered him a scholarship. Yale University also offered Milt a scholarship, an academic scholarship, with the expectation that he would play both baseball and basketball. He was placed with the Class B Roanoke Red Sox in the Piedmont League for the 1948 season. “It was a big adjustment,” he admitted. “I was the youngest player in the league, and when the Red Sox sent me back to Roanoke for the following season I was still the youngest player.” Bolling played two years with Roanoke, making the All-Star team in the second year. He was advanced in 1950 to Single-A Scranton of the Eastern League, playing under Jack “Slug” Burns. He liked Burns: “All the managers and coaches changed my batting style every year. The only one that let me hit like I felt comfortable hitting was Jack Burns in 1950, and I had my best year ever in batting average.” He hit .288 for Scranton. Never a standout hitter, Bolling averaged just .236 in his minor-league seasons, but the Red Sox were in need of a good fielding shortstop and, based on his stellar play in Birmingham, he had become a solid prospect. While at Birmingham in 1952, Bolling married Joanne Chastain, his high-school sweetheart, on May 5. In September he was called up to the Red Sox. Boston wasted no time letting him see action; he played in the first major-league game he saw, on September 10, against the Detroit Tigers at Briggs Stadium, as a late-innings replacement for Johnny Lipon at shortstop. “I remember having a difficult time finding my hat and glove,” he remembered. Bolling walked his first time up against southpaw Bill Wight, and then singled in his first official at-bat in the ninth. The next day was his first major-league start, and Virgil Trucks was pitching for the Tigers. “He was also from Alabama, and he threw hard,” Bolling said. He singled in his first at-bat and later walked, finishing 1-for-3. Bolling said he appreciated the interest and guidance shown him by his manager, Lou Boudreau, who “taught me many things about shortstop that had never occurred to me.” He said he also appreciated the help he got from coaches George Susce (“one of the hardest working baseball coaches ever”) and Bill McKechnie (“the best ever to read pitchers. He could call about every pitch, and would relay what was coming with a word sound.”) McKechnie, a pennant-winning major-league manager, was very much like Milt – religious, grounded, and not prone to salty language. The right-handed hitting Bolling batted .222 in 11 late-season games, with one home run and three RBIs in 36 at-bats. In Sarasota, Florida, during spring training in 1953, Mike Higgins, his former minor-league manager, said, “The Red Sox won’t need another shortstop for 10 years.” Milt earned the starting shortstop job for the season opener. On May 19 against the St. Louis Browns, Bolling’s hit an eighth-inning single off the legendary Satchel Paige, a fellow Mobilian, to drive home the winning run in a 4-3 victory. In the field he was also excelling. Manager Lou Boudreau told sportswriters, “Bolling’s shortstopping has been exceptional. His range is better than some of the veterans in the league and he has caught on quickly as a double-play maker.” He did well at the plate, too. Bolling hit a career-high .263 in his rookie year, with an on-base percentage of .318 and a slugging percentage of .353. In late July, in a game against the Chicago White Sox, Bolling suffered an injury that affected his throwing motion. “I was on first base and a ground ball was hit to the left side of the infield. When I started my slide into second, [White Sox second baseman] Nellie Fox told me to stand up there was no play. When I tried to hold up, my spikes got caught and I catapulted right over the bag.” He was told that he had torn the ligaments in his ankle. The doctor bandaged it and put the shortstop on crutches, rather than a cast. He was playing pretty well at the time of the injury, with some writers seeing him as a contender for Rookie of the Year. There was pressure to return Milt to the lineup and after three weeks he was back playing. “I probably returned to the lineup too soon,” he recalled. “When I came back, I couldn’t put any weight on my left foot, and my throws lost their carry and started to sink.” The changed throwing motion he employed to compensate for the injury seemed to develop into an unwelcome habit. Unfortunately, he had 23 errors in 109 games, placing him last in fielding percentage (.956) among regular American League shortstops, with one of the lower range factors. 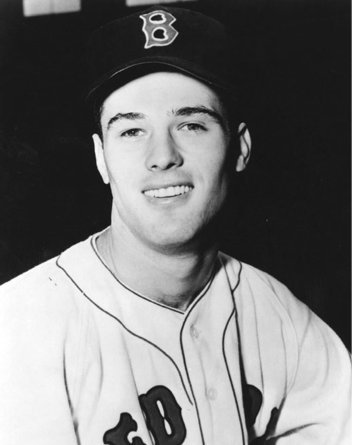 Boston believed in his potential, however, and Bolling returned as the starting shortstop in 1954; he readily admitted to struggling defensively because of his throwing problem. Still, he was able to start a rare shortstop-to-second-to-first-to-home triple play in a game against the Baltimore Orioles on June 23. Even with the injury, Milt played in 113 games in 1954 and though his batting average fell to .249, he hit more doubles (20) than the year before, and his on-base percentage (.337) and slugging percentage (.368) both rose, as did his runs batted in and home run totals. His fielding percentage dropped to .946, again lowest among the AL regulars. His RF/G, however, was the best in the league - he was getting to everything but struggling with his throwing. In 1955, Mike Higgins became the Red Sox manager and told Bolling he would be his shortstop; but Milt dislocated his elbow in a collision at second base in spring training and played in just six games that season. Bolling played in 45 games in 1956 and batted .212. In April 1957, he was traded to the Washington Senators with pitcher Russ Kemmerer and outfielder Faye Throneberry for pitchers Bob Chakales and Dean Stone. He appeared in 91 games with Washington and batted .227 with 277 at-bats); he played more games at second than at shortstop, and proved more successful in the field at the second-base position. While Milt and Frank played together with the Tigers, in other years they played against each other. One night in Washington when the Tigers were in town, Milt tagged Frank out on an attempted steal at second base, and got his glove hand spiked in the process. After the game, Frank noticed a bandage on Milt’s left hand and asked him what had happened; completely unaware that he’d dealt the blow. The 1958 season was Bolling’s last as an active player. It is difficult to know how his career would have gone without the unfortunate string of injuries; but at the age of 27, he decided it was time to retire as a player. Over his career in the majors, he logged 400 games and batted .241 with 19 home runs and 94 RBIs. Bolling had a good relationship with Red Sox owner Tom Yawkey, who would seek out Milt to join him in games of pepper. Milt would toss batting practice with Yawkey using some lively balls so he could hit a few off the Green Monster. He was also frequent company in the sky box watching and discussing the games with Yawkey. In January 1965 Bolling became a scout for the Red Sox covering the Southeast. He moved back to Mobile, in large part because his father had become ill with emphysema. He also supervised Latin American scouting and did national cross-checking on players the Red Sox considered high draft possibilities. He played a major part in bringing players like Tony and Billy Conigliaro, George Scott, Butch Hobson, Dave Stapleton, and others into the Boston fold. Milt’s scouting network leveraged his relationship with former teammates like Boo Ferriss. Ferriss recalled, “When I was [coaching] at Delta State, I could always count on Milt to recommend outstanding high school and junior college players.” Boo goes on, “I never questioned his judgment, and I have always appreciated his great recruiting help.” Boo in turn would keep an eye out for major league prospects for Milt. Eddie Kasko, who became the Red Sox director of scouting in 1978, said Bolling made his job a great deal easier. “The thing I appreciated most about Milt was that he was self-directed,” Kasko said. “I never had to have his prospects cross-checked, and he never gave me a ‘maybe.’ He waited until he was sure and then he gave you a firm answer. I learned an awful lot about scouting from Milt.” Always a mentor, in 1965 Bolling reprised his days as sports editor of his high-school paper by penning a baseball book for youngsters titled Isometrics for Little Leaguers. The book presented 28 exercises designed to strengthen young ballplayers’ muscles and hand/eye coordination. After 43 years with Boston as a player, executive assistant, and scout Milt retired from the Red Sox organization in 1995. The Bollings’ oldest daughter, Angie Bolling, is an actress and model who has appeared in the movies and made several TV commercials. The family’s baseball connection extends beyond father, uncle, and brother to Milt’s sister, Carolyn, who is married to Bill Earnhart, a scout for the Arizona Diamondbacks. Bolling is a member of the Mobile Sports Hall of Fame, the Spring Hill College Hall of Fame, and McGill-Toolen High School Hall of Fame. Hank Aaron Stadium, home of the Mobile BayBears minor- league team and Arizona Diamondbacks affiliate is found at the intersection of Satchel Paige Avenue and Bolling Brothers Boulevard. Bolling told Herb Crehan of Red Sox Magazine, “It was a most enjoyable experience to be a part of, in my estimation, the best organization in Major League Baseball. And Red Sox fans are the best fans in baseball.” Milt’s teammates, coaches, fellow players, scouts, executives, and fans probably feel the same way about him. Bolling died at age 82 on January 19, 2013 in Mobile, Alabama. Henry Aaron with Lonnie Wheeler, I Had a Hammer: The Hank Aaron Story (New York, NY: Harper Collins, 1991). Bill Ballew, “Milt Bolling’s Long Career Comes to a Close,” Diehard, January 1995. Cary Bolling, video interviews with Milt Bolling, Frank Bolling, Bill Menton, Donnie Wagner, et. al., Mobile, AL, March 7, 8, 9, and 11, 2005. Frank Bolling, interview with author, April, 2010. Milt Bolling, interviews with author, April 19, 2005; August 27 and 30, 2006; April 7 and 8 2009; May 11, 19, and 24, 2009; July 8, 2009. Herb Crehan, “Adopted Sons of New England’s Team: Milt Bolling,” Red Sox Magazine, 2009, 3rd edition. Herb Crehan, interviews with Milt Bolling, April 19 and 24, 2009. Joe Cuhaj, and Tamra Carraway-Hinckle, Baseball in Mobile (Arcadia, 2003). Boo Ferriss, interview, May 5, 2010. Rich Goldman, video interview with Milt Bolling, Nome, AK, 1984. Bill Nowlin, "Bill 'Doc' Prothro,” The Baseball Biography Project, SABR. Bill Plott, “Where Are They Now: Milt Bolling,” Birmingham News, July 3, 1995. Ed Rumill, “Milt Bolling’s Rookie Development Popular with Others on Red Sox," Christian Science Monitor, May 20, 1953. Ed Rumill, “Sophomore Milt Bolling on Sox Comeback Trail.” Christian Science Monitor, March 24, 1954. Ed Rumill, “Bolling Shows Courage in Comeback at Fenway.” Christian Science Monitor, August 21, 1956. Ed Rumill, “Milt Bolling Returns to Fenway Park as New Second Baseman of Senators.” Christian Science Monitor, August 10, 1957. Ed Rumill, “‘Teacher’ Sain’s Secret? Dearborn Meeting Milt Bolling.” Christian Science Monitor, July 2, 1965. Arthur Sampson, Boston Herald, May 20, 1953. Glenn Stout and Richard Johnson, The Dodgers: 120 Years of Dodgers Baseball (New York, NY: Houghton Mifflin, 2004). Frank Sullivan, interview, May 18, 2009. Joseph Warner, “The Bolling Brothers Remember,” Mobile Sports Examiner, September 17, 2009. Joseph Warner, “The Bolling Sisters-in-Law,” Mobile Sports Examiner, October 17, 2009.